In the great and grand scheme of all things, it is not big news. To the tiny and tight community, which is the 3100 mile race, Petr turning 30 today, is a special and precious event. Everyone, will sincerely wish Petr, a happy birthday as they arrive. He will not spend this day celebrating. He will do what he has done for the past 35 days, and run his best. The real difference today, is that the good will of brothers, friends, and comrades will be a buoyant and powerful force, that if it does not take him farther on the ground, will still likely take him higher within his own heart. Pavol had told me at the start of the race, that he was looking forward to really hot days. I ask him, now that they are here, does he still enjoy them. He tells me, that since he is walking all day, and not running, he definitely likes the heat. Vajra has just explained to Elmar the importance of coring pineapples. Elmar tells him, he thinks that the core is the best part. And for no particular reason, here are Suprabha and Asprihanal tying their shoes this morning. Suprabha ran 53 miles yesterday and will almost definitely make 2000 miles by tonight. Asprihanal had another great day yesterday and ran the most of anyone with 71 miles. There is no real time, in the few vaporous minutes, that disappear like the wind before the start of the race, to have a proper birthday party. Yet, this is the way it is done here, after the start, before everyone spreads out and around the course. In the first lap Smarana and Petr are running together. First one says, and then the other says, "you were hunting me like a rabbit." Neither explains why they have said this of the other. There is no rivalry, they are both brothers in pursuit of an elusive dream. They are separated by the smallest of margins, just 12 miles. Which is just a blink in life, of the longest race in the world. Do they inspire each other to dig deeper and work harder, most likely. Yesterday Smarana ran 64.21 miles and Petr ran 63.11. There is no question, that Petr is starting the day on an incredible high. His fellow runners have just sung the birthday song for him, in the opening yards at the start of the day. He tells me, "I treasure this song from the runners. Its nice to celebrate my birthday here, it is very special." He tells me that when he came to the race last year he did not expect that Sri Chinmoy would r ecognize it. Yet at 10:30 in the morning, when he came by in Vinaya's car, he handed him a card signed by all the runners and a red shirt. Sri Chinmoy also spoke to him, and though he cannot remember exactly what he said, he thinks it was, "I am offering you my heart's love, gratitude, and blessings." He says that Sahishnu, the evening race director was the first to wish him Happy Birthday, the night before. He thought it was very sweet of him to do this. I come upon Christopher who seems eager to chat. Yesterday he ran the best mileage that he has run in nearly 2 weeks, 56 miles. He tells me about a small and personal miracle. He says, "Its incredible, my feet were so weak, I had to concentrate, to hold them straight." He demonstrates by splaying his feet off to either side. He was told that there would not be a chiropractor visiting the race until Monday. With no medical assistance anywhere on the horizon, he says he spent the time, instead of complaining by concentrating on Sri Chinmoy. He says with a smile, "Guru fixed it." Then, he wants to demonstrate for me, an invention of his, he calls a wake up hat. As we pass his table he instructs me to grab a particular green cap. He tells me that, he is going to act out for me, what the hat can do. His first demonstration is of extreme tiredness. I am not sure if other caps can produce the same wake up capabilities, but certainly Christoper swears by this one. 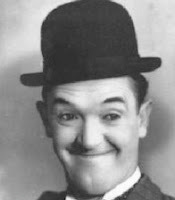 By adjusting it just so, it pulls up, the furrows of the forehead and as an additional bonus makes the wearer look, a lot like Stan Laurel of Laurel and Hardy. And though this doesn't count as race news, I thought you might like to know, that on Saturday, Parsons Blvd. was temporarily shut down in front of the enterprises there. Someone noticed several large cracks in the apartment building, that perches on top of the Stationary store, the health food store, and the flower shop. The residents of the building were at first asked to leave, and then let back inside. The stores are closed for now and a barrier has been placed on scaffolding to protect pedestrians. Here are two local citizenry, who are wondering where they will have to go now, to find firm tofu, greeting cards, and snap dragons. Is the destruction-dance of death. In His Vision's self-transcendence height. Excerpt from The Silence-Song by Sri Chinmoy. When we are on earth and blessed with such a rare and unique event and with the Grace of God can be part of it with Utpal's blog it brings out the best in yourself. It s a transforming experience for the readers also.